FANBOY PLANET.com . : mc-monster-500 :. We recommended this toy line on the podcast, but that was actually before I had had a chance to see Kid McCaw play around with the app and a couple of the toys. From the 9 year old perspective, we have a hearty thumbs up, with a lot of motor revving and toilet-flushing sound effects (because he had "Croc Pot"). Available exclusively at Toys R Us, Monster 500 currently consists of 10 diecast cars and 4 larger electronic cars (bigger versions of the diecast ones), with two race track playsets. Of course, this is the 21st century, so they're more interactive than THAT. Monster 500 is also a free app available on iPhones, iPads and Androids, absolutely FREE. It's a standard racing game, similar to that pioneered on the SNES with Super Mario Kart, but adapted to its own comically grotesque visuals. Yes, you can pay for upgrades as well as earn some in-game, but even at its most basic, it's easily playable, with increasingly difficult tracks and more aggressive opponents. Because apparently, in the post-apocalyptic wasteland, monsters will have only one thing left to love: racing. Of such silly premises are addicting toy lines made, of course. 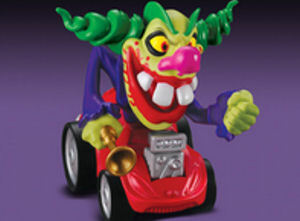 Kids love toy cars, and they love monsters, as long as they're not too scary. 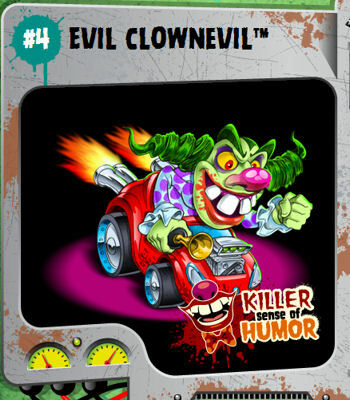 Influenced by Ed "Big Daddy" Roth's Ratfink designs, Monster 500 hits all the modern monster tropes but makes them fun, if not out and out lovable. It's the kind of toy line, too, that makes one shake his fist like a cranky old man and say kids don't know how good they have it. Yes, I remember Ratfink models, oversized and somehow nowhere near as detailed as his drawings. With modern technology, however, Monster 500 toys are almost perfect replicas of their digital selves, even at the $5.99 diecast level. Each toy comes with a code to unlock a racer in the app. The diecast line includes a trading card with that code. Our limited experience so far is that the game racers are random -- for example, from the code with Lead Foot (the Bigfoot riff) we unlocked Turbo Chainsaw Maverick, and with Croc Pot we got Dr. Jerkyll and Mr. Ride (which also led to an interesting conversation when we watched Mad Monster Party later that day). But here's the thing -- as much as personally I've enjoyed playing videogames with figures like Skylanders or Disney Infinity, ultimately those toys just sort of sit there. Monster 500 is as playable in reality as in the virtual world. Every fifteen minutes or so, I'd hear a Lead Foot growl or a Croc Pot flush (and they light up, too!) as these toys kept drawing my son back in. We did not get the tracks, but a cursory look at them at Toys R Us makes me assume it's comparable to a Hot Wheels stunt track, and experience has taught me that can keep kids busy -- if not exactly quiet -- for hours.